George Henry Hughes, son of John George Hughes and Elizabeth Ferdinande Olesen, was born in West Hartlepool, England on March 19, 1898. His baptism took place at St. Aidan’s Church, West Hartlepool, England on Easter Sunday, April, 10, 1898. His sponsors were his grandparents, John George and Mary Ann Storey Hughes, and his uncle, Samuel Hughes. On May 9, 1906, when George Henry was eight, the family emigrated from England. Their new home was to be in Pittsburgh, Pennsylvania, in what is referred to as the South Side. George returned to England with is mother to visit family and friends in the fall of 1907. They returned to the United States on the ship Cedric. I have several photo postcards of George, as a boy, at summer camp and a photograph of him with his school classmates at Humbolt School on the South Side. George graduated in 1912 at the age of 14 and went to work. By 1916 the Hughes family had moved to Woodlawn, Pennsylvania (today Aliquippa). George was employed as a draftsman with American Bridge Company in Ambridge, Pennsylvania across the river from Woodlawn. It was during this time that George met his bride to be, Sarah Margaret VanGilder. The story that has been passed down to me is that everyone wanted to meet and date “the handsome new boy on the block”. George first dated one of Sarah’s older sisters, but he fell in love with blonde haired Sarah, known as Sally. Sarah Margaret VanGilder, daughter of George Ethelbert VanGilder and Jessica B. Pool, was born on March 2, 1898 in Morgantown, West Virginia. She had spent her younger years growing up in Morgantown. About 1913 the family moved to Woodlawn, Pennsylvania, in Beaver County, where Sarah's mother operated a boarding house for steel workers. Sarah was employed as a stenographer after she graduated from school. The romance was put on “hold” during World War I. George was anxious to participate in the war, but was turned down by the United States Army because he had poor eyesight. He decided to go to Canada and on August 1, 1917 enlisted in the Canadian Expeditionary Force in Toronto, Canada. After extensive training with the Vickers Machine gun George was made a sergeant. He was to ship out to France when England told the Canadian troops that they needed somebody to protect their interests in Russia, so he was sent to the Gournastai Barracks, Vladivostok, Siberia. In the April 15, 1919 edition, the Ambridge local newspaper printed a letter from George that he sent to “Pop” Uhle at American Bridge Company. The letter gives interesting insight into the Russian people, weather, and other countries that have troops stationed in Siberia. On May 16, 1919, in Toronto, Canada, George was honorably discharged from service. Almost one year later, on June 5, 1920, George married Sarah VanGilder at Easton Presbyterian Church, Fairmont, West Virginia. The wedding was performed by Rev. H.G. Stoetzer and Sarah’s oldest sister, Mary Louise VanGilder (“Bobs”) was a witness. The family rented a home at 615 Ohio River Boulevard in Avalon, Pennsylvania, a town on the north side of the Ohio River west of Pittsburgh, for more than twenty five years. About 1945-1946 George, Sarah and daughter Faith, moved to Monaca and lived with George’s mother until Faith graduated from Monaca High School. The next day they all moved to Bellevue, Pennsylvania, a town beside Avalon. I have many happy memories of family fun and gatherings at the two Bellevue addresses where George and Sarah (my Grams and Pop Pop) lived. People gravitated to them. Both were friendly and outgoing and people simply wanted to be with them! Pop Pop would think nothing of inviting co-workers home for dinner, and Grams would be able to stretch a meal at the last minute to accommodate a table full of hungry men. And could she ever cook and bake! Nothing fancy, just good plain food. On October 11, 1961, George’s mother, Elizabeth Olesen Hughes, who had been living with them at 71 North Bryant Street in Bellevue, died. I hve been told by several family members that it was felt that Pop Pop would fall apart when his mother died, but he threw some dirt in on her coffin at the grave and never looked back. George retired from American Bridge Company with over forty five years of service and took a cruise around the world with Sara (Sarah). At some time Grams changed the spelling of her name, dropping the final “h.” In 1965 they made a second voyage. During one of the trips, they stopped in West Hartlepool to see the old hometown. Pop Pop was very discouraged as there were no family members left that he could find. George and Sara retired to St. Petersburg, Florida. George died on June 23, 1973 in South Pasadena, Florida. His body was cremated. Sara Hughes continued to live in the St. Petersburg area staying at their condominium until the early 1980’s and then moving to Sunny Shores Retirement Village. She died there at the age of 94. Her body was cremated and buried beside her husband at Allegheny Memorial Park Cemetery, Allison Park, Pennsylvania. A little editorial comment: Grams and Pop Pop will always hold a special place in my heart. They were two of the most amiable and gracious individuals that it was my privilege to know. I will be forever grateful for their loving guidance during my childhood and teen years. 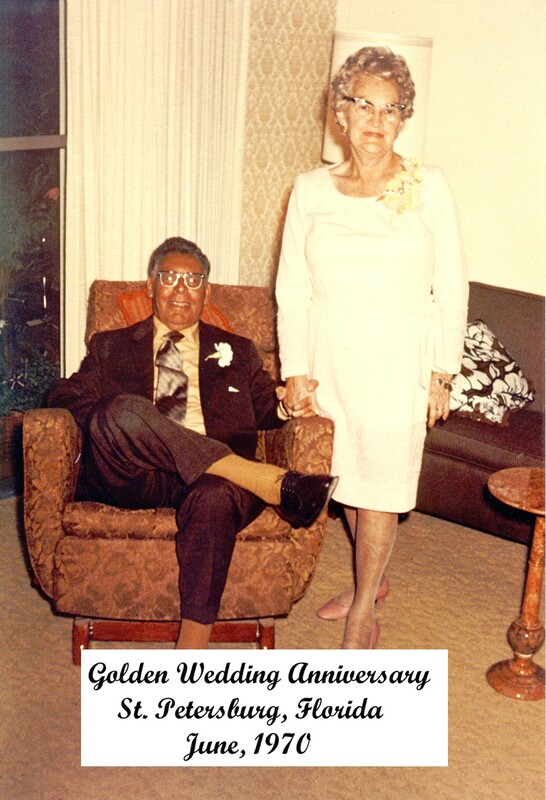 GEORGE VANGILDER HUGHES, born July 1, 1921 in Pittsburgh, Pennsylvania married first MARTHA JEAN STARK on November 23, 1943 in Pittsburgh, Pennsylvania, married second Edna Mae Thomas on January 25, 1982 in Pittsburgh, Pennsylvania. John Aiden Hughes, born February 7, 1929 in Pittsburgh, Pennsylvania; married first Barbara Ann McGoey on March 1, 1954 in Detroit, Michigan, married second, Patricia Madden Schank and died October 30 1990 in Novi, Michigan. Faith Carol Hughes, born September 29, 1932 in Pittsburgh, Pennsylvania married Edward Norman Roolf, Jr. on May 7, 1955 in Pittsburgh, Pennsylvania. Comprehensive history of the English roots at the Hartlepool Page. This is where it all began for Pop Pop!